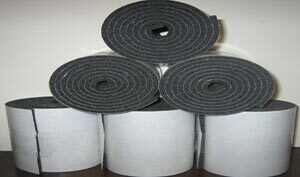 If Your Futon Doesn't listen and stay on the frame properly these Super Grip Rolls will really work. Each Roll measures approximately 4" X 60". 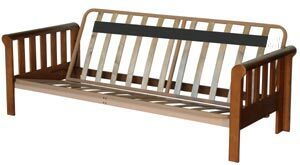 They are sold Each, and we recommend 2 Rolls for Each Futon Frame. One for the Seat, and one for the Back. Our Super GRIP Rolls are just what the doctor ordered to effectively keep your Foam or Innerspring futon in place; keeps it from sliding down in the frame. THEY REALLY DO WORK!!! Since many futons are so plush and plump these days, customers who are not used to this in a futon may have initial trouble bending their futon or getting it to stay in place. TRY THESE, THEY ARE THE BEST GRIPPERS ON THE MARKET, HANDS DOWN…BECAUSE THEY WORK! These strips are designed so that the bottom of the strip adheres to the slats of the frame (so it doesn't move), and the top of the strip (made of foam) holds the futon by the resistance or friction created between the foam on the strip and the futon's fabric as they touch. The Advantage with these compared to the strips is that you only have to peel one to put them on. Important: Think Opposite! Try to remove the foam from the Paper backing, not the Paper from the Foam. To use the Rolls, roll the foam part of each strip in a corner. The adhesive will kind of stick to your finger, and then you will be able to peel off the paper backing. On the Back deck, attach the length of the roll on the slats towards the front edge on the top of the frame, about 6" down from the top of the back as shown in the picture. On the Seat Deck, place the length of the Roll on the slats towards the top of the edge of the frame about 6" from the front of the seat, like what's shown on the Back Section.